Written by Philip Howell-Williams on January 18, 2015. A new study from the World Bank and the think tank IZA World of Labor compares the earnings of homosexuals with their straight counterparts and makes for interesting reading. In summary, the news is good for lesbians but not for gay men. According to the figures, gay women are paid on average 12% more than straight women although the differential varies significantly from country to country. In the UK the difference is 8%, in Germany it is 11% but lesbians in the US fare the best, earning 20% more than heterosexual women. Other countries boast a less exemplary record when it comes to equality. Greece and Australia are the worst places for gay women in terms of salary as they earn respectively 8% and 28% less than straight women in those countries. Gay men on the other hand are universally penalised in the workplace, earning less than their heterosexual peers in all the countries featured in the study. The differential varies from 4% in the Netherlands to as high as 16% in the US. The author of the report, Dr Nick Drydakis, who is senior lecturer in economics at Anglia Ruskin University in the UK, has offered some explanations for these differences. He speculates that homosexual women make career and lifestyle choices early on which differentiate them from straight women who are more likely to expect to sacrifice or put their careers on hold to start a family and adopt traditional gender-based roles. Gay women are more likely to stay in education longer, choose degrees appropriate to higher paid careers, work longer hours and follow male-dominated career paths. In short, they possess more stereotypical ‘male’ qualities and businesses discriminate in favour of these so-called masculine traits. Gay men on the other hand suffer discrimination in the workplace because they are perceived to lack these same qualities and do not conform to traditional gender roles. 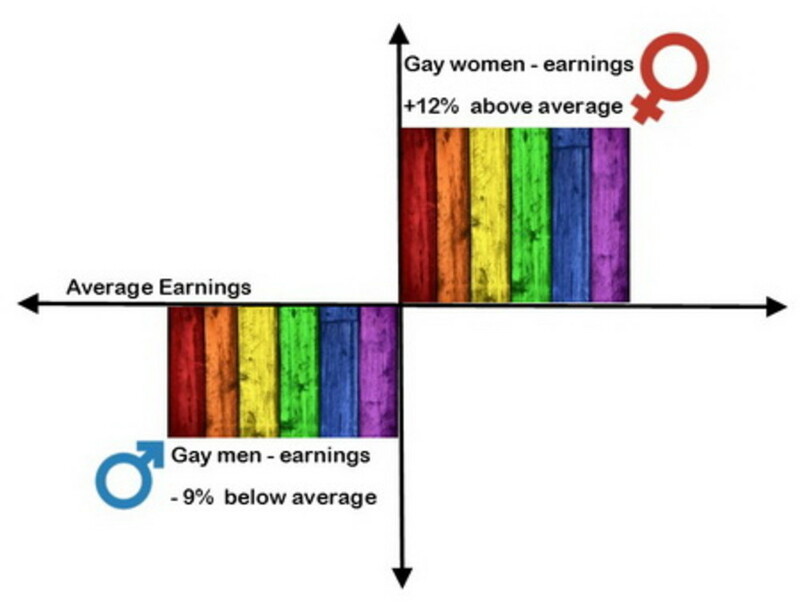 Drydakis claims that many organisations are actively biased against gay men and that there is a direct correlation between the difference in earnings between gay and straight men and the anti-gay sentiment of individual companies. It is perhaps unsurprising that complaints of harassment and unfair treatment at work are higher for homosexual workers and that this same group are more likely to rate their job satisfaction as low. The report calls for governments to improve opportunities within the workplace for homosexual staff, to promote respect and equality in the workplace and to publish annual data to facilitate the progress of equal rights. It is a sad fact that over 80% of countries still have no legislation in place to prevent sexual discrimination in the workplace and there is still a long way to go in this particular battle. Posted on January 18, 2015 in LGBT .